Abdulfatah Sabouni at his newly opened retail location in Sunridge Mall in Calgary on Dec. 17, 2018. It’s a cold December day in Calgary – “very nice weather for making soap,” says Abdulfatah Sabouni, the owner of Aleppo Savon. The fourth-generation soap maker spent a quarter-century in business in Syria, making renowned Aleppo soap in the product’s namesake city. The hard soap, traditionally produced in wintertime, is distinctive for its use of laurel oil. The Syrian civil war forced Mr. Sabouni and his family to leave Aleppo in 2015. They went to Jordan first, where Mr. Sabouni tried to keep his business going, before coming to Canada as government-assisted refugees in January, 2016. He’s now working hard to recover that. 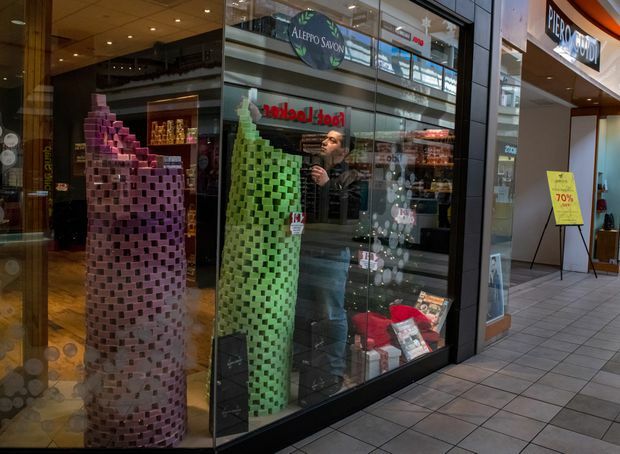 Mr. Sabouni opened an Aleppo Savon factory and store in southeast Calgary in January, 2018, followed by two retail locations in Calgary malls, in October and December. The handmade soap is also available in a handful of Calgary Safeway and Sobeys stores and is sold to a growing customer base online. Many Canadian consumers, used to long ingredient lists on their soaps, like Aleppo Savon’s simplicity. There are few ingredients and no chemicals. “People try it, they love it, they come back,” Mr. Sabouni says, standing in the Aleppo Savon factory, near towering stacks of curing green soap. He’s joined by his 13-year-old son Abdulkader, who helps in the store on Saturdays. A fourth-generation soap maker in his native Syria, Mr. Sabouni towers up bars of green soap at his Aleppo Savon store in Calgary on Dec. 18, 2018. Centuries-old methods are followed to make the natural soap, including drying it for about six months. During that time, the outside colour changes from green to brown or yellow. Scented, coloured bars, such as lavender and lemon, are available, but the more traditional laurel oil soap remains the most popular. It’s a process that’s taken Mr. Sabouni, whose last name means soap maker in Arabic, years to master. Those skills are now a competitive advantage; while some Canadian businesses sell imported soap made in Aleppo, Mr. Sabouni believes he is the only one manufacturing it in North America. Mr. Sabouni didn’t initially expect to keep making soap in Canada. But that changed when a new friend, Sam Nammoura, encouraged him to bring a few bags of soap he had made in Jordan to a market at a Calgary festival. The soap sold out quickly. “From that moment, I knew he was really onto something, because the response was overwhelming,” says Mr. Nammoura, co-founder of the Calgary Immigrant Support Society, an organization initially launched to assist Syrian refugees. Mr. Sabouni began making soap in his kitchen and Mr. Nammoura helped get the word out on social media. Early customers became return customers, and told others. “His customers are the best salespeople,” Mr. Nammoura says. For Mr. Sabouni, that initial reception was encouraging. He partnered with another Syrian refugee he met through English classes, Walid Balsha, as well as Syrian-Canadian Husny Hadry to open Aleppo Savon. Aside from a website and social-media accounts, Mr. Sabouni has not put a lot of work into traditional marketing. He says many people learned about the business from media stories about the store’s grand opening, and he’s spread the word in other ways, such as participating in the city’s Doors Open event to give hundreds of people free tours of Aleppo Savon’s facility. That strong reception to the first store – in an unlikely location in a southeast industrial area – encouraged Mr. Sabouni to expand to stores in malls, “closer to people,” he says. Mr. Nammoura, who owns a security business, describes Mr. Sabouni as a qualified and hardworking entrepreneur. “I have a lot of admiration for his determination and eagerness,” he says. For his part, Mr. Sabouni is driven by what he lost. He compares his current production – about 400 kilograms of soap a day – with the 5,000 kilograms of soap his business produced daily in Syria. Mr. Sabouni inspects a bar of soap at his Aleppo Savon factory in Calgary. In Syria, his company used to produce 5,000 kilograms of soap a day, now he makes approximately 400 kilograms daily. After an impressive first year of business, Mr. Sabouni is looking at opening retail locations in other Canadian cities. He also wants to expand the wholesale side of the business, and may look at exporting to other countries in the future. In Syria, his business exported Aleppo soap to Iraq, Europe and Asia. “It’s hard work. I like hard work,” Mr. Sabouni says. Starting a business is difficult whether you’re born in Canada or not, says Leah Hamilton, an associate professor in the Bissett School of Business at Calgary’s Mount Royal University who studies the social and economic integration of immigrants and refugees in Canada. Newcomers to the country and refugees may also face additional challenges, she says, including language barriers, a lack of credit history in Canada, a lack of familiarity with Canadian business laws and norms, and smaller social and professional networks. Still, newcomers across Canada have higher rates of entrepreneurship than people born here, Ms. Hamilton says. Some, such as Mr. Sabouni, bring years of experience in a particular industry. “I think that business acumen he gained in Syria would certainly transfer to the Canadian context,” she says. Ms. Hamilton also notes the rapid resettlement of Syrian refugees in Calgary has meant increased awareness around a business like Mr. Sabouni’s. She herself received Aleppo Savon soap from a friend for Christmas. “A lot of Canadians and Calgarians want to support Syrian refugees and help in their resettlement,” Ms. Hamilton says, adding buying from a business such as Aleppo Savon is one way to do that. Such support buoys Mr. Sabouni. He notes that his hometown of Aleppo was famous for soap. “People would say ‘please, bring me the soap from Aleppo,’ ” he says.